The last few months, I've been trying out a new way to manage my laundry, and it's working really well for me. And it's a good thing, because my laundry? It needed managing. Before, I was letting it all pile up, and then, overwhelmed and stressed, I'd feel like I needed a marthon laundry day to catch up on it all. It was a constant battle. Instead, I've made out a schedule for myself. I've assigned each day one or two specific loads of laundry that need to be done that day. Wednesday, for example, is towels and Adam's laundry (which he does himself, but a fair bit of supervision is required). Thursdays is for mine and Hubs' whites and lights. Each day I try to get only those couple of loads done. I don't worry about trying to have a moment when all the laundry in the house is finished (does such a thing even exist? ), I simply concentrate on each day's particular "assignment". The best part is that when (not if) I get behind, I only have to catch up to that particular day of the week, which is much less overwhelming than trying to launder everything. I keep a copy of the schedule taped to the washer, and another copy to my upstairs bathroom mirror, to remind me each morning to get that load downstairs and started at the beginning of the day. 48. GRAMMY-My refrigerator make me happy. 88. Trixie @ Farmhomelife (What Food Stamp Challenge? 122. Homeschoolin\' Hot-rodders- easy reading! 167. Elena My Domestic church - WW walking plan! Now this, I need to do. I'm really good at letting the laundry go for, oh, maybe a week. Then it's a marathon session, and one washer just isn't enough. Ugh...laundry...isn't that a four-letter word, too? For some reason, this is one chore I haven't shared with my children (the folding and putting away, yes; the washing, no). Maybe if I scheduled it similarly, I might be more willing. What's funny (to me) is otherwise, I'm not a huge micro-manager with how well my kids handle their responsibilities. Laundry? I'm too darn picky. I'll take any ideas I can, though, to make it easier! Thanks, Shannon :). I like! I've tried doing a load every day, but your schedule makes a lot more sense. You're just so smart! Great idea for scheduling laundry. I often get on a roll and want to finish it ALL. But then I can't seem to put it all away. Laundry has got to be the most thankless job of motherhood. Do two loads today, and the family promptly replaces the pile so you have something to do tomorrow. At least it's great job security! Thanks for the scheduling tip! Maybe it will free me from constantly looking for the floor! My main problem is that I don't mind getting it started and eventually transferred to the dryer. I really don't even mind folding it all that much. But putting it away? Completely different ball game. It seems someone is always running to the laundry room in their undies looking for some clean pants! Hi, This is my first time linking here. I had those problems with laundry. And used a 3 compartment hamper. I also made my kids and hubby responsible for there own laundry. As I could not get up and down the steps so easy. I had and area made up stairs for laundry and all was well with the world. I have no basement here at this house. And it is just me and hubby now. So I do all laundry. I just love main floor laundry area. Would never do without it again. I used to try to do that. But I've been lacking. Need to get back on board! Great advice! I try to do one load a day almost every single day, and it helps me maintain the beast! Thanks for sharing. And for hosting. This is fun! I do the same thing with the normal housework--have a few things a day to do so I don't end up trying to do it all in one day. Laundry is one day for now, being that we don't yet generate more than can usually be done in one day. But it helps big time!! Great strategy - especially having a copy stuck upstairs. Since I am a SAHM I enjoy doing laundry. I sort all my laundry into loads every monday evening. I will usually have ten loads. First think on Tuesday I put the first load in, do a few chores, then throw them into the dryer, etc. I usually finish up the ten loads by Wednesday and have everything put away. I may iron a few things on Thursday. But that is it. No more laundry until the next Tuesday. I can't bare to face laundry everyday. This works best for me. My 16 yo does ALLL the laundry. Of course, I must "encourage" her most days...if she'll just do 1 load a day, it rarely gets backed up. Thank you very much for your posts and your Meme. Awesome idea! I do something similar ... one load per day ... any load. One-loads are so much better than many-loads! :) I think you're onto somethin'! I wrote about the same topic. I could never keep up with our laundry without a schedule and a set way of doing it. Two loads a day, six days a week, keeps us on top of Mount Washmore. I'm not a mom yet, but I just moved back home to live with my family after living on my own for four years. Laundry was never an issue, because I just did all my laundry every two weeks (maybe 2-3 loads). Now that I'm back at home, I see why my mom always used to complain about the laundry. My parents were out of town last weekend and I did all the laundry in the house, which was about six loads. I was proud of myself, but then two days later, all the hampers were full! All that to say, I really admire moms who even try to keep their laundry under control. You have this 22-year-old's respect. My laundry woes are not in the starting, but in the finishing! I actually love to sort the colors, put the fresh smelling detergent in the big basin and start up a load. I don't even mind transferring the clean, wet clothes to the dryer. But please.don't.make.me.fold!!! If anyone ever invents a strategy for folding and delivering please share the good news! That's a great idea...you don't feel behind, and you don't even have to think about what you're going to wash for the day. I love this idea--I'm definitely going to try it. Laundry at our house completely overwhelms me too. It's hard if I miss five days, I end up with 12 loads--crazy! thanks. Great idea. I do love me some scheduling! Seriously, having a plan just works. Thanks for sharing. I hate laundry. Scheduled and unscheduled. Great idea. ANYTHING that can help with that dreaded chore! I am always trying to get caught up.... I think I will try this! This is my first time participating in WFMW...I've loved all the great ideas that are shared here! I've been doing similarly for awhile now and it makes such a difference! There are only 3 of us, so I do the majority of our washing on Monday (usually 3 loads) and then put up the things that needed to hang dry on Tues - it's so nice not to run out of undies midweek! :) If laundry seems to be piling up more than normal, I'll do an extra load Thurs/Fri - but so far, it's really worked for us! Good idea - I don't have anything so defined, but my plan is always to a load or two a day and stay on top of it. Not always the case, but that is what I attempt each week. I really need to do something like that. With 2 toddlers and 2 adults in a tiny apartment, there's no room for dirty laundry. Fabulous tip! I always do one load every day, but I don't have them designated and that would really help me. I put a load in the washing machine at night, and then set my timer for 6:00 a.m. - when I get up I have a load all finished and ready to go on the clothes line (or in the dryer in the winter). you know, i wanted to try that a couple years ago, but hubs was mostly in charge of the laundry at that time and wasn't so interested in my "schedule" (ironically, because he is the more scheduled of the two of us!). so, the laundry schedule never happened. now that i'm home more, i'm doing more of the laundry and definitely feeling overwhelmed (i wash cloth diapers too, though). a schedule sounds like the perfect solution! I only do one load a day, too! I love it and it has complretely taken the stress out of laundry in this house! I've been thinking about doing this and loosely made a schedule in my mind. I need to move to the next step of writing it down and putting it where I will be reminded. Thanks for the tip! That is a GREAT idea. I am going to give that a try. At least I will feel like I have accomplished some laundry in a day. Great idea! I have been trying something similar...on a smaller scale. I just tell myself to do 1-2 loads a day, but I never thought of a schedule. I may just try it! Laundry has become a MAJOR source of stress for me lately. We moved a few months ago, and the place we're renting now didn't come with a washer and dryer. We were able to buy a washer when we first moved in, but the dryer is on hold until we have the cash for it. Which is going to be awhile. Meanwhile, the piles of laundry are growing and growing while the one load a day I'm able to do s.l.o.w.l.y. dries on the drying rack. And I've started clenching my jaw in my sleep again. I don't think it's a coincidence. That's how my mom used to do laundry. I do it all on Monday. If it doesn't get done then, well, so be it. Or at least that's what I tell myself! I'm just happy the kids are finally putting their own away! Great plan, Shannon! We have to schedule our laundry daily, too. The only day off we have from it is Sunday. Of course, if we have sickies in the house, we do laundry on Sundays, too. Fabulous tip! I always try to do at least one load per day, but never thought about scheduling it like that! Great idea!!! That's how I do my laundry, too. I don't have a specific schedule for each day, but I bring it down to the laundry room, sort it, and then depending on what we need the most, I decide on one or two loads to do each weekday. And that's it. If I'm feeling up to it, I toss in an extra one, but if I can only manage the one I started, then that's fine. I find I keep on top of it way better than I did when I tried to do it all in one day. Sounds like coming to peace with the laundry beast is the key, no matter what the schedule. I'm still working on that. Love your blog! Among others, you've inspired me to start my own. Thanks. So many things would work better for me if I had a schedule. For some reason I resist, though. Great idea! I just put the laundry on every morning at exactly the same time, and do one load a day. It seems to work fine. Except when you run out of laundry soap, as I have. I dumped the remains of three jugs of detergent into the washer today and still barely had enough. And I have no plans to go grocery shopping for a while. So next time I'm going to buy a bigger jug! A lady used to work in my office and had a teenage son. One September he went off to college and she came shortly after that and announced to us all: "I saw something in my house today I haven't seen in 18 years!" We all were interested to hear what she had seen and she told us: "the bottom of my laundry basket!" This has been my system for the last five years, and it works great. And the best part is, I rarely have to do laundry on the weekend! You mean you have a schedule??? I just do laundry 24/7. No joke. First thing I check when I wake up. Change it after breakfast. Again after lunch, etc... Last thing I do before I go to bed. I'd never stay ahead of it otherwise. That is a very good idea! I will try it. I've found that doing laundry every Monday works best for me... but I've already noticed that with a baby, laundry is increasing! I like your system. There are some days that I look at my pile of ever mounting laundry and I get crazy urges to throw away all my childrens clothing except for an outfit for each day of the week! Alas this wardrobe simplicity never comes to pass because when it comes right down to it I'm addicted to my Childrens clothing. I worked hard to find those good deals and the pants with the buttons on the inseam so that they'ed fit my string bean boys. Why does it take forever for us to figure out the simplest of things?? Great tip; I can't wait to put this into action in our own home. I really dislike laundry... and perhaps I should try a schedule. I will try anything to help with laundry. It is the bane of my existence! This is my first time trying out the Works for Me Wednesday... lets hope I did it right! I do something similar. 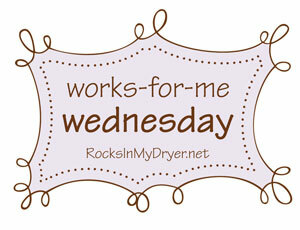 I'm always looking for way to organize, simplify and streamline the laundry process!! Love this. I haven't tried scheduling, but I think I will. I've been trying to do "only" one or two loads a day. I like having specific types on any given day. I don't have a specific day I do laundry either, I do it when one of the three laundry baskets I have for darks, whites, or colors has a full load's worth of clothes in it. I also keep an extra bottle of stain treater next to the laundry baskets, so I can pretreat stains on my clothes before they hit the basket. Otherwise I'd never do it. Now if only I could teach my husband the difference between dark clothes and brightly colored ones, I'd be in buisness. Oh, and yes, I already tried labling the baskets. It didn't work except for the whites. That's a great idea! I'm still very much in the college mode of doing laundry... keep it all piled in the hamper until I absolutely have nothing left to wear of some essential item, and then spend a whole afternoon and night doing it. Of course, it helped living in a dorm with a ton of washer, so I could do 3 loads at a time. Even now, my apartment building has 2 washers which are never occupied, so I can still get away with it. Problem is, laundry is doubling next week (getting married!). Also, this method means things like linens and towels get neglected, because there usually isn't room for them once I've stuffed all of the shirts that I own into a washer. I think I'll have to try your way. This is exactly what I do. One load a day. Which I can handle. Even if I get one day behind I can still handle. Thanks so much for hosting this! I have learned so much. I do my laundry everyday and it does help to stay on top of a not-so-fine task. I forgot to put in my little summary. Whoops! All my laundry problems were solved when we got a washing machine on the second floor : ). Oh, and I decided to mix whites and colors and everything else, and just hope for the best. I can't be separating. That's WAY too stressful for me : )! Sunday off. It keeps it manageable for me. I do this too. Another thing that helps is that we sort as we take the clothes off. I have the wire and net collapsible hampers. I have signs on each one that my mom made for me. There is one for whites, darks, reds and colors. I have a separate hamper for towels. I hope to get back to the schedule, but for now, I just grab the hamper that is the fullest and get it in the wash in the AM when the kids are eating. Now, if only I could find an efficient way to get the folding done! I too have a hard time with laundry. Not neccessarily getting it done but getting it folded and put away. So my question for you is do you do that one load then fold it right away and put it away too????????? Great! I wish I could do a load of laundry everyday. I always have to play catch up at least once a week because I don't have a washer/dryer in my house. But recently I took all my backed up loads and did them at the laundry mat so now I am almost caught up. You're right--you can never be totally caught up. But it's nice to have the laundry done. Thanks for the great post. I am totally overwhelmed by laundry, and then get so out of sorts when I can't find anything to wear -- ever. I just made my schedule, and it's going on the wall! My laundry discipline method has been my pledge to line dry all but towels. Line drying takes commitment and needs a day or two on the inside line. I've only been at it for about 6 weeks, but I've already seen a 30.00 drop in my electric bill. Let me tell you what I do. If they day is predicted to be sunny, I'll get moving, wash and hang a load or two outside. In Ohio, it is warm but notsomuch that laundry is dry lickedy-split. I'll leave it out all day. When it is damp, rainy, cold or soon-to-be-snowing, I'll hang the laundry on the downstairs lines. It'll take sometimes overnight or a few days depending. A tip mom gave me? Tumble the clothes for 5 minutes in the dryer before hanging. I admit that the only draw back was some stiffness (and I don't use softener because of allergies in the family.) You know? It works! I get one dryer load a week, which I reserve for towels. I haven't found the trick to line drying towels without them feeling like I was rubbing very coarse sandpaper against my wet skin. Ugh! With 6 people living in my house, and 4 are under 9, laundry is a never ending battle. I have a plan similar to yours, except, I just plan on doing 2 loads a day, except for weekends. The only issue with that is when I have to do the sheets, then I must add another load to a day. I have found the 2 loads a day is just enough to keep ahead, and not let it back up. Since I hang to clothes out when the weather is nice, 2 loads are just enough to let them dry during the day. I am done washing by 9am, and they hang all day until 4pm. Took your suggestion, and it's working wonderfully. I crave all the laundry to be done at once, but it's a good feeling to stay "on top of it" more than once a week! !